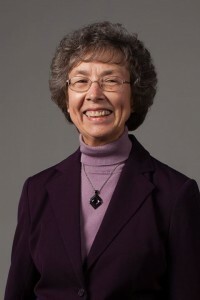 Dr. Paulette Sauders is about to complete her 50th year teaching at Grace College. Only three others have reached this esteemed milestone at Grace (Dr. Homer Kent, Jr., Ron Henry and R. Wayne Snider), but Sauders is the first faculty member to accomplish this while still actively teaching full-time. Sauders graduated from Grace College in 1964 with a bachelor’s in English Education. After teaching for a year at the Akron Bible Institute — where she met and married her husband, Chuck — she was appointed professor of English and Journalism at Grace in 1965. Over the years, she earned her master’s in Literature from Saint Francis University and her doctorate in English Literature from Ball State University, where she became a C.S. Lewis scholar. For 35 years, Sauders has taken Grace students on a two-day trip to Stratford, Canada, to attend plays at the Shakespeare Festival Theatre, and since 1995, she’s taken students to England over spring break to visit London, Oxford, Windsor, Stratford, Bath, Stonehenge/Salisbury and Wales. Sauders will continue to chair the Languages, Literature and Communication Department and teach full time. Here’s to another decade! She and her husband, Chuck, attend the Grace Brethren Church, Winona Lake, Ind. (Bruce Barlow, lead pastor).